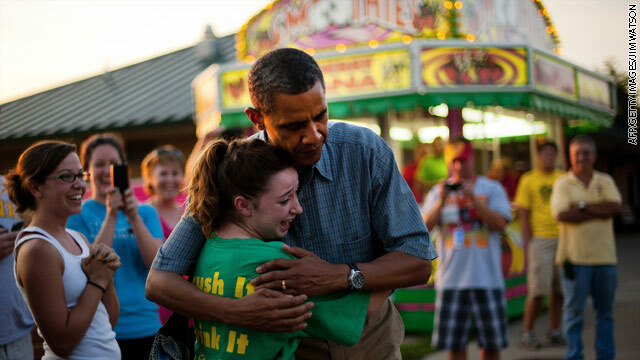 President Obama gets a hug from an Iowan woman at the Iowa State Fair on Monday night. After an evening at the Iowa State Fair, President Obama continues his trek across the state with day two of his campaign bus tour. Today's stops include events in Oskaloosa, Marshalltown, and Waterloo and we expect several unexpected stops in between. We expect he'll continue to hit Republican Vice Presidential candidate Paul Ryan like he did yesterday when he repeated his claim that Ryan is the "ideological leader of the Republicans in Congress". And of course, he'll continue to talk about what he calls the "fundamental difference in visions" between he and Republican Mitt Romney. For the full guidance released by the White House, click below. Why isn't the Drone kill list review with his campaign manager ever on this list? Ohhh.., its just regurgitation.., never mind..
You're such a dimwit. He is a good man, an average guy and someone that all Americans can relate to. Obama-Biden will crush Romney-Ryan in November. Who in their right mind would wants to give more tax cuts to millionaires and billionaires. Romney-Ryan would do just that because they are bankrolled by millionaires and billionaries. RYAN has the courage to tell the truth ... unlike Obama and the democrats, who lie, in a desperate attempt to buy votes. We are spending more than we have. Our entitlement programs are unsustainable, However, the obama stooges continue to misinform, blame, demonize, and lie. Why was Oblunder on T.V. yesterday the view i think it is with those over the hill fat women, why wasnt Oblunder tryi ng to create jobs, Why is Oblameo even running he said if he didnt cut the deficet in half he wouldnt run, he said if unemp was over 6% he wouldnt run. What a liar and joke he has turned out to be, Solydyne great investment, ill close gitmo, Is anyone seeing a pathalogical liar here???? How about the Robme-Ryan lies. We are not going to throw grandma over the cliff. Why don't we give millionaires and billionaires more tax-cuts. Take that for a lie. Please vote for me, I'll give you free stuff. Go post your comments on Fox News. This is the Communist News Network as right-wing nuts like to say. Obama is a con man ... the main stream media are his shills ... and, the American people are his marks. Howard, go to Fox news and post your comments. Oh, i forget, they don't allow you to post messages anymore. Now who is the communist news network. Get off this site, it is for liberals. You now the blogging police? Maybe the blogging bully? Ever hear of the 1st amendment? We have not heard from the right-wing nut "Jerry". Maybe he has morphed into "bb", "demwit" and "kool-aid police"
That woman is way more excited to be hugging Obama than he is to be hugging her haha.